The concept of leadership is no longer bound by traditional notions of authority and, increasingly, the world is witnessing the impact of those who — with an entrepreneurial mindset — are using business, technology and media to engender peaceful societal transformation that is propelled from the bottom up. These individuals, showing a creativity and determination that is often lacking in the established echelons of power, are challenging perceptions of what can be achieved by ordinary citizens and making their mark as genuine leaders who do not simply talk of change, but take active steps to instigate it. GATHER, a new practical action initiative from Seeds of Peace, aims to provide such trailblazers — and the growing number of those who are following their example — with a much needed forum for discourse, learning and, significantly, connection to those who have the knowledge and resources necessary to bring viable, transformative ideas to fruition. Evidence shows that the success of social improvement programs stimulate positive shifts within communities in conflict and establish foundations through which peace can take root. Consequently, GATHER aims to furnish emerging leaders with the focused support that will empower them to realize social, political and economic development initiatives, the by-product of which will be the spontaneous and organic unfolding of conciliation. GATHER+962 is scheduled to take place at the Mövenpick Resort at the Dead Sea in Jordan, from 26th February to 1st March, 2015. Over three productive days, we will bring together emerging leaders with established figures from the world of philanthropy, diplomacy, finance, education, technology and media. Crucially, during our ‘Social Networking’ hours, GATHER staff will facilitate introductions between participants and the delegates who may be the source of help or guidance to drive their prospective initiatives forward. The event will also be the platform for the launch of our Seed Fellows Program. This fellowship program is open to those who have exemplified extraordinary achievement, or who demonstrate such potential, as activists in the entrepreneurial social change arena. Successful candidates will be recipients of a grant and be eligible to participate in our 2015 Leadership Incubator. GATHER +962 has the support of the Royal Court of the Hashemite Kingdom of Jordan and is hosted by Seeds of Peace. For more information on the event, eligibility for attendance and application to the Seed Fellows Program, please contact gather@seedsofpeace.org. and Kenneth P. Cohen, Esq. From October 23-26, 2014, over 250 people—NGO leaders, social entrepreneurs, members of the business and philanthropic community, and other change makers—will meet in Jordan for the invitation-only GATHER+962: the inaugural Seeds of Peace-hosted ideas and action summit. We invite you to GATHER with other emerging leaders whose commitment to social change and conflict transformation demonstrate the greatest potential to create real change in their societies. We invite you to GATHER with us for three days of networking, inspiration and ideation. This year, GATHER is paying special attention to emerging leaders who are engaged in the fields of Social and Business Entrepreneurship, Media and Technology and Women’s Empowerment. GATHER+962 will include presentations by keynote speakers, themed panels of experts discussions and more intimate and action-oriented working sessions. GATHER+962 has the support of the Royal Court of the Hashemite Kingdom of Jordan and is hosted by Seeds of Peace. Contact gather@seedsofpeace.org for more information. The space and time dedicated for inspiration, sparking debate and discussion, encouraging participation and interaction, and exposing participants to new ideas, role models, success stories and experiences of failure and lessons learnt. ‘Inspire Talks’ feature a morning speaker, setting the tone for the day and sharing her/his unique perspectives. The ‘Discussion Series’ offer participants multiple expert-led interactive discussion groups running simultaneously covering a number of topics to select from. Experts leading these discussions represent emerging and established leaders, different perspectives on the topic on hand as well as diversified experiences. ‘Open Spaces’ is the opportunity for participants to participate, pitch their own topics to discuss, skills to pass to others, skills to learn or activity to lead. Opportunities for networking, interacting and connectivity among participants and attendees throughout the four days spent at the Dead Sea, Jordan. Our time at GATHER+962 is limited. We know that every moment counts. We are, therefore, making sure that any networking opportunity outside the main agenda schedule – during lunch, over a coffee break, on your way from one session to the next- allows for meaningful exchanges among all participants. We all need some ‘play’ time especially after or during (or even before) a long content-driven day. Yoga, meditation, a dip in the Dead Sea, music, a cup of tea, dance, or interactive theatre will sure help you unplug, freshen up, reset those amazing ideas brewing in your head, and get to know your peers and other GATHER+962 participants in a different light. I am GATHER-ing because I strongly believe in the power that our shared commitment to advancing positive change in and across our communities holds. GATHER represents the next stage for Seeds of Peace—an opportunity to invest in and accelerate the work of our alumni, and to harness the resources of our greater network to develop collective strategies that challenge the status quo and bring about change. It’s time to come together; it’s time to act. I am looking forward to convening with friends, colleagues, and fellow travelers at GATHER to share inspiration, incubate new ideas, and foster relationships for the future. I am continually inspired by the work I see our Seeds and their peers doing across the globe. 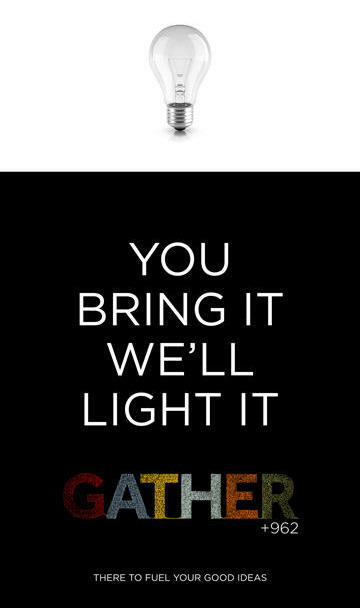 GATHER gives us the opportunity to celebrate this work, amplify its impact and bring outstanding people together. Great things happen when great minds come together. I want to GATHER to be inspired by young professionals and innovators from around the globe—those who are possessed with a vision and committed through their actions to create change in their communities. I want to GATHER because I believe that all people—across the scope of professions, ages, nationalities, and backgrounds—have the capacity to pursue and enact meaningful change and fuel inspiration within one another. I am taking part in GATHER to contribute to building a platform for spreading ideas, inspiring young professionals and pioneers to be more hopeful, more joyful, and more thoughtful and , and a result, to positively affect their communities. GATHER gives me the chance to reconnect with old friends, meet inspiring leaders, and hone my own sense of purpose. I am looking forward to learning from such an accomplished and talented group of people. I joined the GATHER team because I know how powerful the Seeds of Peace network is for individual growth and development within the most volatile and uncertain contexts.